A retractable saw blade and fine-edge knife blade are built into the outer case of the 14-in-1 Multi-Tool Sidekick from Leatherman, ready for action at a moment's notice. The case unfolds to form the handles of spring-action needle-nose pliers, complete with a recessed regular-pliers section to grasp rounded objects and a cutter to slice through wire and soft metals. With-in the handles are an assortment of fold-out tools that you will be using with increasing regularity, including a serrated knife, bottle opener, can opener, wood/metal file, 2 flathead screwdrivers and a Phillips screwdriver. Primary blade length: 2.6 in. 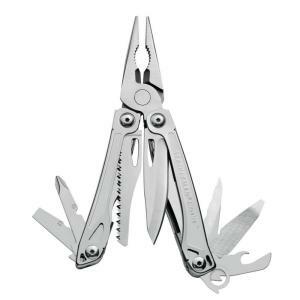 Tbook.com crawls the web to find the best prices and availability on Leatherman and related Tools and Hardware products like Leatherman Tool Group Sidekick Stainless Steel 14-in-1 Multi-Tool. For this page, related items include products we find that match the following keywords: "Leatherman" at our vendor partner Home Depot. Leatherman Tool Group Sidekick Stainless Steel 14-in-1 Multi-Tool is one of 14 Leatherman and related products listed in the Tools and Hardware section of Tbook.com If you have any questions on this product, please give us a call at 734-971-1210 during the hours of 9am - 5pm EST for assistance. Thank you for shopping at Tbook.com, the Internet Department Store!